This month's update (a week late as I got back Friday from a vacation in New York City) is three banks of fifty patches from Åke Danielson . I have started posting new patch contributions in sysex format only, compressed as zip. I may simplify the patch downloads page to eliminate other formats (like Galaxy) and compression formats (.tar.gz, .sit) with the exception of the audio files. Others are getting virtually no downloads any more. Any objections? 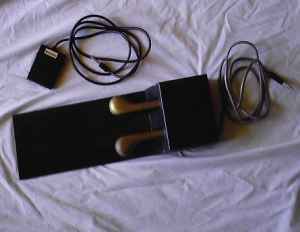 The Australian Expander is back on Ebay (with a lowered price). Seems the price was lowered to AU$3999 but is now back up to $4999 [item #250254038816]. If it was sold for this amount, it would far surpass other recent sales in the US$3500 range, for instance 21030668 in 2005 [see post Chroma Inflation]. Hi - I'm selling up to four voice boards for the Chroma or Expander on eBay [item #260249790421]. They are the standard type. They work correctly intermittently. Too bad they're being sold to US buyers only. Hey USA – there is something outside your borders – it's called the rest of the world! Hi - This should answer some questions. Yeah, silly me. I didn't send it to the obvious list !! Haha. Revived 21030632 last night. Add it to the register [it's been in the registry since 2005]. Not mine though. Yes, I'll ship to Europe. after a succesful installation of the SPSU. 1 voice is silent with no output from oscillator to filter. Will need to measure a few things to confirm that it is getting any CV's. I did the calibration on each voice using the manual method as described in the service manual but have a hard time getting some of the voices to null out the fundemental. I guess this Chroma is in need of a full recap to solve the problem. First I need to confirm that I'm getting exactly 5.050 V from the SPSU. I didn't have my Fluke at hand when doing it so I only could adjust it to 5.05x. after a succesful installation of the SPSU. --- First I need to confirm that I'm getting exactly 5.050 V from the SPSU. I didn't have my Fluke at hand when doing it so I only could adjust it to 5.05x. Noise routed through the filter works like a charm so definately an oscillator problem. OK, I have tons of sysex for my Chroma all safely filed and sorted away in Sounddiver. Apple has dropped the product and the editing functions of Sounddiver leave much to be desired. So, I am contemplating starting to code an editor for the new MIDI interface. Are folks interested in this? I can't say when it would be done but I kind of need to know if there is interest as that will affect how "clean" I make my code etc. Is the new MIDI interface sysex format the same as the KromaKult one? Is there a complete sysex spec available for the interface (I would assume so)? I'm not sure if the interface supports single parameter dumps or if I need to redump entire programs. Anyhow, it will be written in .NET so it will PC only, sorry but I'm not willing to muck about with anything else. So, if there is demand, let me know and let me know if you have some expertise with the sysex spec and I'll get started and keep the group posted. Look at the manual at the chroma website. You can edit some parameters with controller commands or you can transfer sysex dumps of single programs and dissassemble them to their individual parameters. ... Is the new MIDI interface sysex format the same as the KromaKult one? The original Syntech/Chroma Cult/KMX interface would allow all programs - or an individual program - to be dumped. The 'new interface' (the CC+) supports program-by-program dumping too - but it also allows parameter-by-parameter reading/writing for Program 0 via SysEx [see CPU Plus User's Guide: MIDI System Exclusive]. Item #250258976999, "But It Now" price of US$$3,859.00, sold from Tokyo, ends June 20. From the description: "100% working. A Kenton MIDI interface is retrofitted so no need of a Chroma keyboard to control it." I've asked the seller for the serial number. This is Expander 16330116, now in the registry. This Expander has been re-listed at the same price as item #250261572435, ends June 27. Posting ID 716742136. 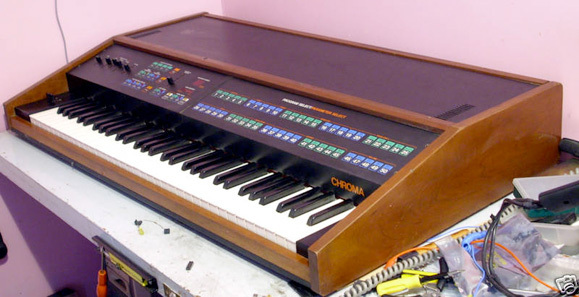 From the description: "very stable and elegant with complete auto-tuning, split-keyboard mode. footswitch, damper pedals, case included. new battery installed." $1500. Would like to buy a working I/O board for my Chroma. I am located in Sweden. I don't know if this helps. I have a spare prototype Chroma I/O board. It worked at one time; it may or may not work now. All of the chips are present on the board. It has a green moisture proof coating like the production boards. It's missing the large, red, two digit readout which plugs in easily. I don't know what it is worth, we can talk. Hi, I recently bought a dead chroma at a used guitar shop. I have some experience repairing electronics, so i thought i might give this synth a shot. Anyways, so far i have replaced the power supply unit with a switching supply and have gotten the computer to boot and transmit midi messages. All lights and buttons work, however there seems to be a serious issue with either all the voice boards, or the channel motherboard. At first no voices would tune and when i did a "split-31" no sound would come out of any output. After replacing z6,z7,z8,z9 and z4 i am able to get what sounds like high pitched noise by doing a "set split-31". checking the "Data latch" (z3) with an oscilloscope i get a very noisy periodic. Any ideas on where to proceed from here would be a great help. unfortunately I do not have a good advice at this moment. I just remember that when I had to fix my Chroma, there were some issues with the latches on the mother board, which lead to the effect that the voice boards could not tune. I would expect that the issue is some how on the mother board and maybe a half dead component decides to bring your system into troubles. Try to measure the lines on both sides of the data latches (this components would be my focus). I also would recommend to "warm up" the Chroma for 30 minutes or more and figure out if the instrument behaves as in cold status. I think you may be right the latches on the motherboard are not putting anything out. I will replace these and see what happens. Hi, I am attempting to troubleshoot my newly acquired chroma. I have found that the DAC may be at fault. I am unable to zero the voltage between TP0 and TP1. The best i can do i negative 4.6 Volts! I have noticed there is a discrepancy between the schematics and the board layout in the output buffer section of the DAC. On my I/O board the variable resistor pin #2 is connected to pin #4 of Z25. 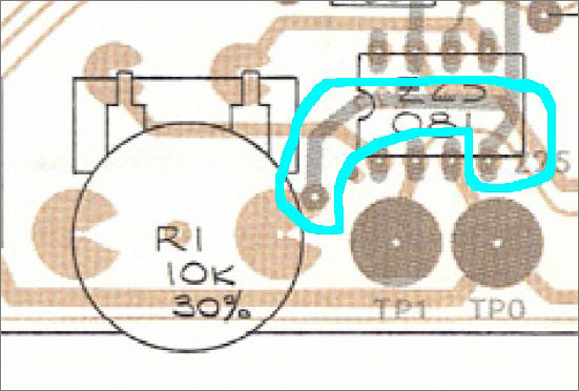 The schematic shows something different, where the resistor pin#1 is attached to resistor pin #2. So maybe this board was layed out incorrectly? However I also noticed that the layout printouts that accompany the schematic in the repair manual mirror what is on my I/O board. Is this a mistake? 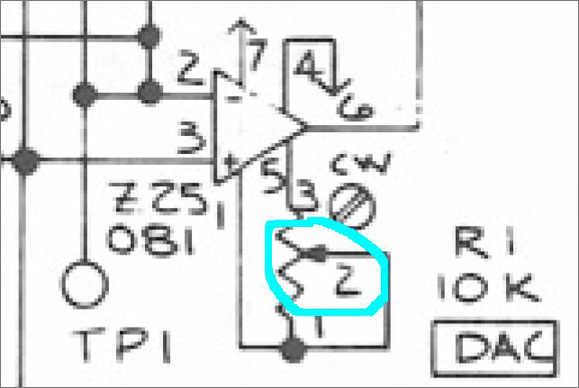 should i cut the trace and route the variable resistor to where the schematic shows it should be? I have attached pictures to illustrate my point. Re: I/O Board Schematic-PCB Discrepancy? I do not think that there is an issue on the layout, otherwise the Chroma would not have worked in the past - also a lot of other Chromas would suffer by this issue. So if you cannot adjust the DAC it might be an issue of Z25 - I would think this is more likely than a bad DAC (but you never know). I also would measure the voltage supply - maybe even after replacement of the PSU, you might have issues. I think you are right. The circuit on the layout seems to be the correct one. I just replaced z25 and the problem will not got away. I am thinking maybe the feedback capacitor (c13) is broken? Well - that might be possible too - I think you have to measure the signals to find out the dead component. But anyway capacitors are always a point to investigate. I (finally) got around to hooking up the internal MIDI connections in the Chroma. Once again, thanks David/Sandro. But, I noticed several unused leads, namely from J3 on the cable/J7 on the CC+ board. The leads named "Disp+" etc. obviously form some sort of display; can any details be shared? Or are there any expected timelines for the release of such hardware? ... I noticed several unused leads, namely from J3 on the cable/J7 on the CC+ board. This is probably related to the still-mysterious C2 module. David and Sandro haven't said anything about this since the CPU Plus was released in June 2006. Andy - these connections are to support an external display, as was discussed in the thread Questions on External Display for CC+ (June 2007). There is no specific schedule associated with the project. It is driven both by user desire as well as our available time. As there hasn't been a lot of the former we haven't dedicated a lot of the latter. You need to hook up the OUT of the BCR-2000 to the IN of the Chroma. The info is going _from_ the programmer _to_ the synth. Thanks I'll try it out ! No problem, keep us updated with the progress! But it responds from another midi source? Or? There are so many available Chroma patch banks to sift through, especially the [Chroma Cult] banks (42 ! ) , I was wondering if anyone could possibly point out some excellent banks mostly comprising of pads, synth choirs, and effects amounst all of these ? I love the Cool Blue type of stuff. Thanks! But, just to be sure... will it fit any standard Chroma? I remember seeing that the spacing between buttons aren't the same. Or does it come with all the necessary switches below too? Plug and play so to speak...? They will fit a standard Chroma AND they come with brand new switches. There is a typo - labeling for Parameters 48 and 49 are reversed. Already got my bid in. I remember the brochure photos and I actually loved the colour scheme! According to Andi Beit, owner of a red or "Halloween" Chroma, the buttons are "perfectly aligned with the membrane switches underneath." After replacing most chips on the motherboard and the entire DAC circuitry my newly acquired chroma is working!! The only remaining issue seems to be dirty stack switches. Does anyone know of a quick way of cleaning these without having to dissasemble them? Maybe spraying them with alcohol or ammonia? You should use alcohol and a pipe cleaner or, maybe, a Q-tip. They are self cleaning contacts so they will get better with use. Note the shape of the contacts and rub them lengthwise with a wet pipe cleaner. If anyone is interested here are the pictures to my newly acquired chroma with a freshly installed PSU. It has the Yellow and Red color scheme. However i cannot find a serial number anywhere. Does this mean someone took out the serial # or was this unit never given one? I'm also wondering why the first and last key of these units are "whiter" than the rest? I love the color scheme on the "Halloween Chromas"......how many of these are out there? We have four in the registry: Andy Beit's 21030620; Mark Smith's 2103-PT-002 and serial-numberless Expander; and now Leonardo's Chroma. Also, Greg Hutchings has a set of panels like the ones Mark currently has up for auction. 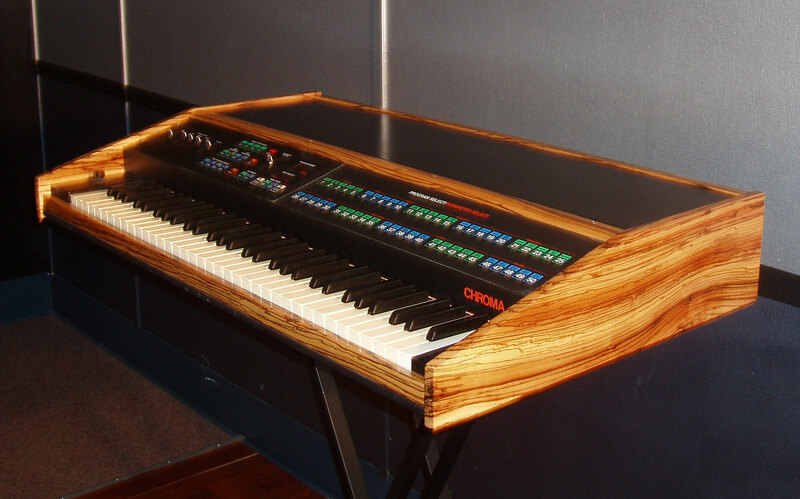 GASing bad over Mark's panels, they'd look great w/ my Zebrawood Chroma...sigh. 1200 GBP, no bids and just hours left. No serial mentioned but is in fully working order. Ben sold a very similar Chroma in the VEMIA auction last April, and it was very satisfactory indeed. I went to meet his driver to collect in person, and then delivered in person as well [see thread Re: Registry Approaches 500 Instruments] - I've had some bad experiences with carriers and Chromas. I'm sure this will be in equally good working order.